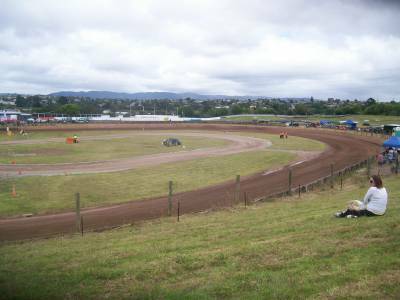 Location - Rosebank Road Speedway is all of five minutes up the North-Western motorway from Western Springs Speedway. Go up the North-Western and take the Rosebank Road off-ramp. At the roundabout take the road to get back on the motorway and on your immediate left should be an entranceway to a road that will take you up alongside the motorway on-ramp. This road leads to the track (and go-kart facility located behind the track). Parking - Parking appeared to be at the top of turns 1 & 2 with earlybirds able to view the track from their vehicles. For the big meetings the go kart track behind turns 3 & 4 provides parking, although you will be forced to wait for a break in the racing as the way to the go-kart track goes perilously close to the speedway track. Premiere Meeting - No meeting on the annual calendar sticks out of the pack as a must attend. Attendances from the international solo riders would be the highlight of most seasons if that happens. 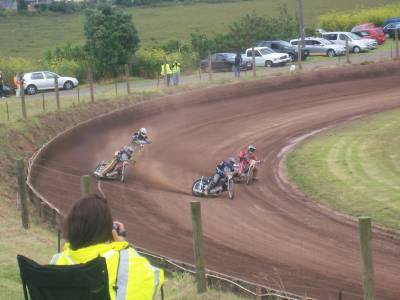 Also worth attending - Auckland solo and sidecar champs. Best spot to sit - Seating is limited to the top of turns 1 & 2. But the small crowds mean you wont have too much difficulty finding a spot. A westerly breeze could lead to uncomfortable conditions as the bank is exposed. The best option is probably to get there early and get a spot in you vehicle. Uniqueness - Rosebank is a specialist bike track and the speedway is a bit different to what we see at your standard New Zealand speedway. As the only specialist bike track in the North Island, Rosebank Rd sits a long way from Moore Park & Oreti Park, the only other such tracks in New Zealand. With most other tracks having abandoned their infield bike tracks, interest in bikes sits at an all-time low adversely affecting the quality of shows.